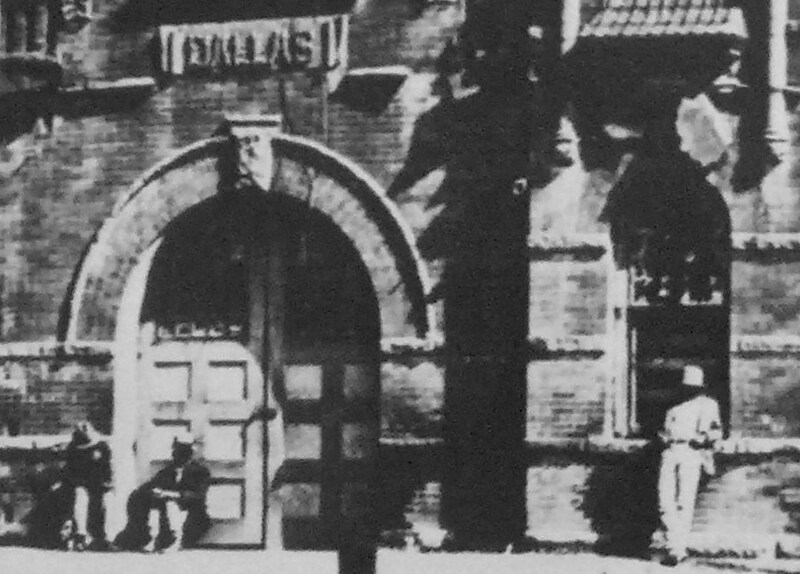 I saw the above rendering of the old East Dallas rail depot posted recently in a Dallas history group. It was bought several years ago by Art Hoffman who was told it had belonged to a former employee of the Houston & Texas Central Railroad (which, along with the Texas & Pacific, served this station). It’s an odd thing for an architect to sketch — a boarded-up railroad depot. I couldn’t find anything on E. L. Watson, the architect who did the rendering (perhaps a member of the Watson family who were prominent Dallas contractors? ), and I couldn’t find any connection between the depot and the F. J. Woerner & Co. architectural firm. The drawing might have been done in 1931, with what looks like “31” next to the artist’s signature. Could the drawing have been done merely as a study for E. L. Watson’s portfolio? But back to the building itself. 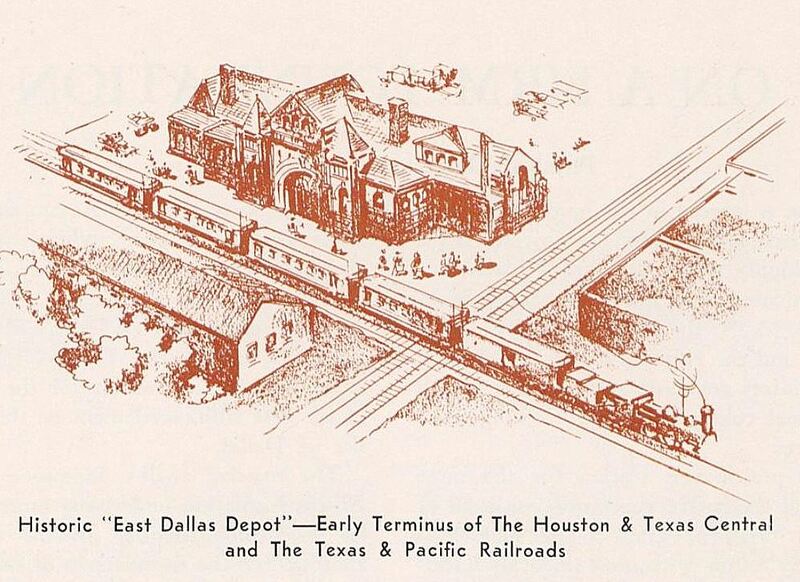 It was referred to by all sorts of names: Union Station, Union Depot, East Dallas Depot, Old Union Station, etc. With all these permutations, it took considerable digging to determine exactly when it had been built and when it had been demolished. A couple of stations had previously occupied this site (about where Pacific Avenue and Central Expressway would cross), the first being built in 1872 at the behest of William H. Gaston who was developing the area, well east of the Dallas city limits. 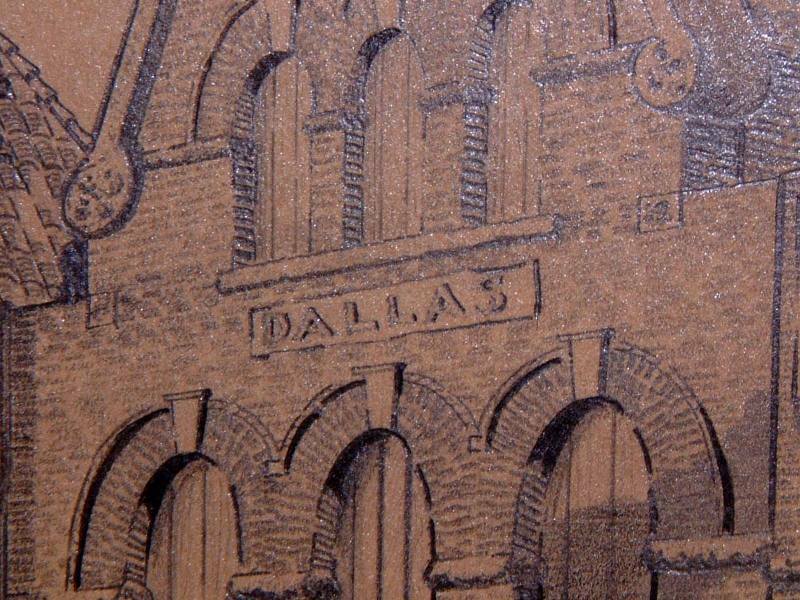 Due to the presence of the railroad, the area grew quickly, and in 1882, it was incorporated as the city of East Dallas. It thrived and continued to grow and on January 1, 1890 it was annexed and became part of the city of Dallas. 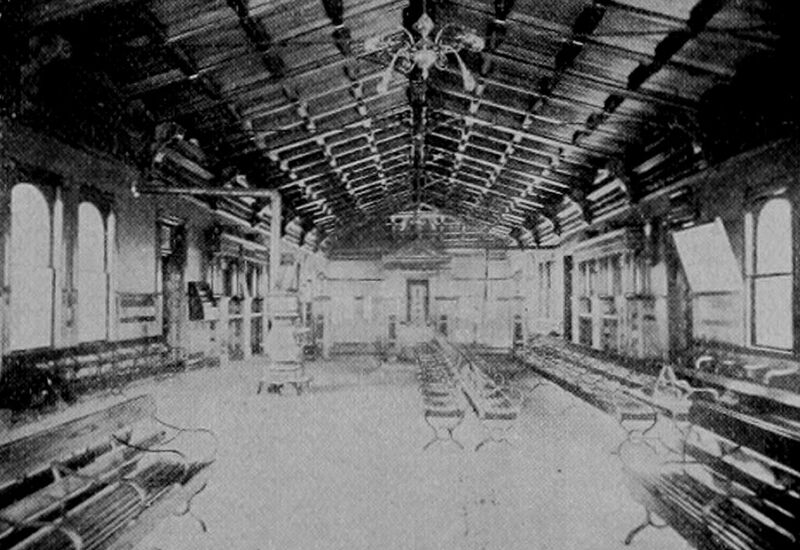 On April 4, 1897, it was reported that plans for a new Texas & Pacific passenger depot were nearly completed. By the beginning of June, the shanty had been torn down, and on June 6, 1897, the drawing below appeared in the pages of the Morning News, giving the people of Dallas a first look at what the much grander station would look like when completed. (It’s unfortunate that the actual architectural rendering was not used, but, instead, a more rudimentary staff artist’s version was printed.) 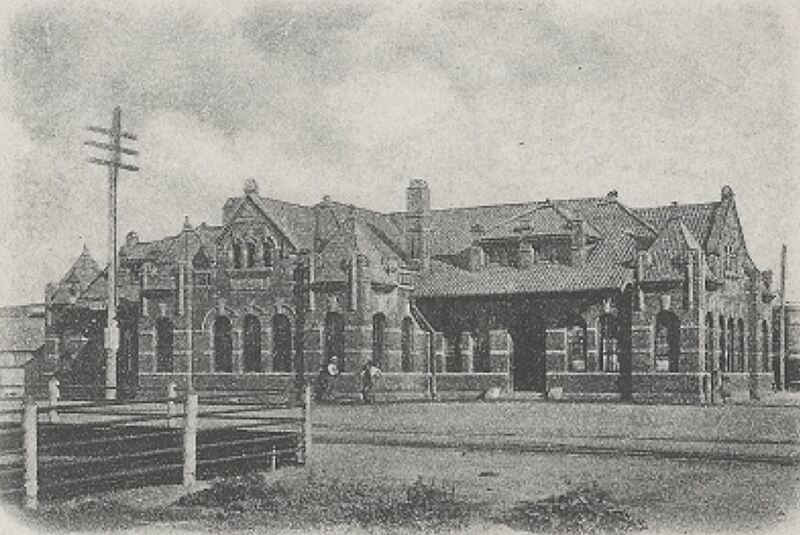 The accompanying information revealed that the new depot had been designed by Mr. O. H. Lang, an architect who worked in the engineering department of the Texas & Pacific Railroad. This was an exciting tidbit to find, because I had wondered who had designed the structure but had been unable to find this elusive piece of information. And it was Otto Lang! Eight years after designing this railroad depot, Lang and fellow architect Frank Witchell would form the legendary firm of Lang & Witchell, and they would go on to design some of Dallas’ most impressive buildings. The building was completed fairly quickly, and its official opening was announced on Oct. 12, 1897. Much better than a shanty! Last use of the depot for railroad purposes came in 1933 when it was abandoned as a freight station in August of that year. After that it was used as a station for interviewing destitute clients for the relief board but for several months has been boarded up. So that original rendering may not have been done in 1931 after all (unless it was a high-concept architect’s vision of what the depot would look like one day all boarded up…). 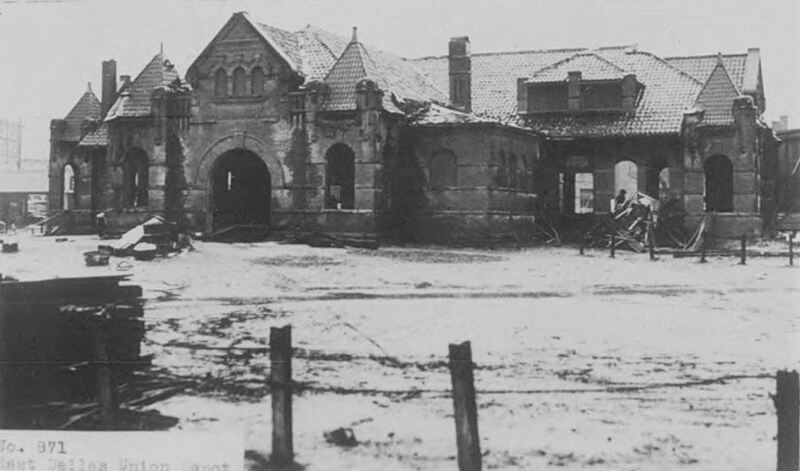 Demolition of the depot — which The News called “The Pride of the Gay Nineties” — began on January 18, 1935. The first solemn paragraph of an article reporting on the razing of the landmark is below. Does this mean that the Dallas Historical Society might still have the second slab? If not, what happened to it? It would have been nice if that little bit of the old depot had survived — a souvenir of an important hub of activity which sprang to life when memories were still fresh of East Dallas being its own separate entity — the “David” Dallas to its neighboring “Goliath” Dallas. I would love to learn more about what might have happened to that “Dallas” sign which, for a while, hung over the fireplace of an odd little building in an obscure park in southeast Dallas where it lived out its days in retirement. 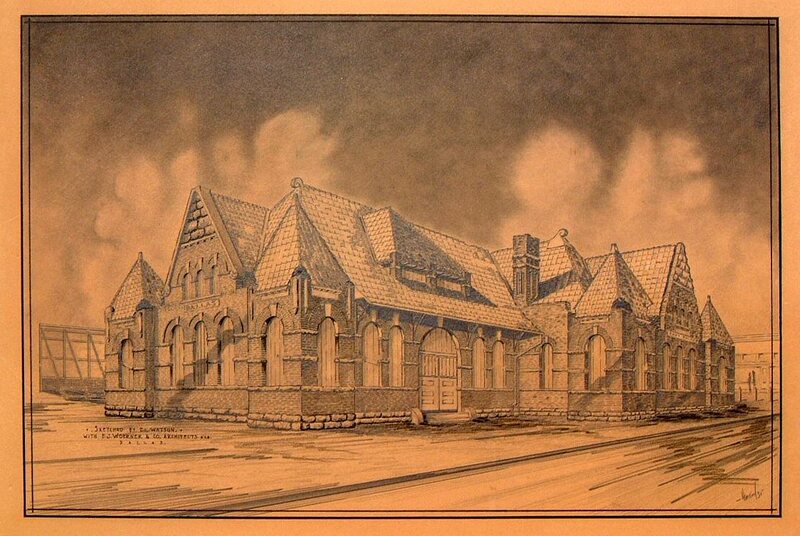 Original rendering of the old Union Depot at East Dallas by E. L. Watson is from the collection of Art Hoffman, used with his permission. More on architect Frank J. Woerner (who designed, among other things, the Stoneleigh Hotel), here (see p. 10 of this PDF). 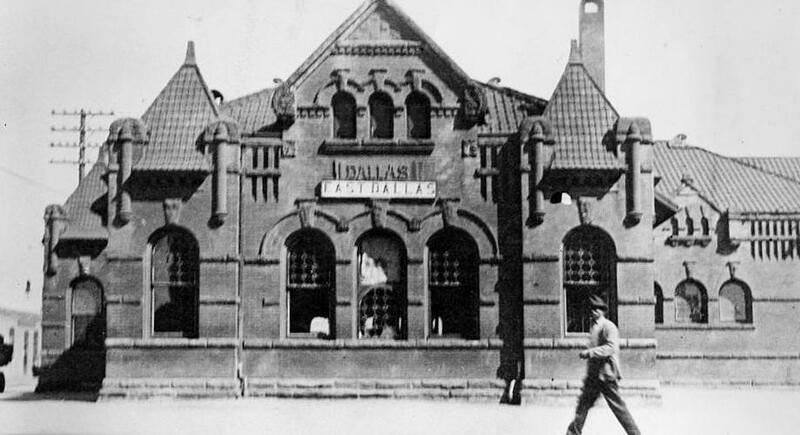 History of Old East Dallas (and the city of East Dallas), here and here. More on architects Lang & Witchell here, with an incredible list of some of the buildings designed by their firm here. 1898 photos of the depot’s exterior and interior from Texas, Along the Line of the Texas & Pacific Ry. (Dallas: Passenger Department of the Texas & Pacific Railway, ). Photo immediately following the photos from the T & P book is from a postcard, found on Flickr, here. Photo (and accompanying detail) immediately following that is from Dallas Rediscovered by William L. McDonald (Dallas: Dallas Historical Society, 1978). (McDonald identifies the photo as being “c. 1890” — well before the station was built in 1897.) From the collection of the Dallas Historical Society. 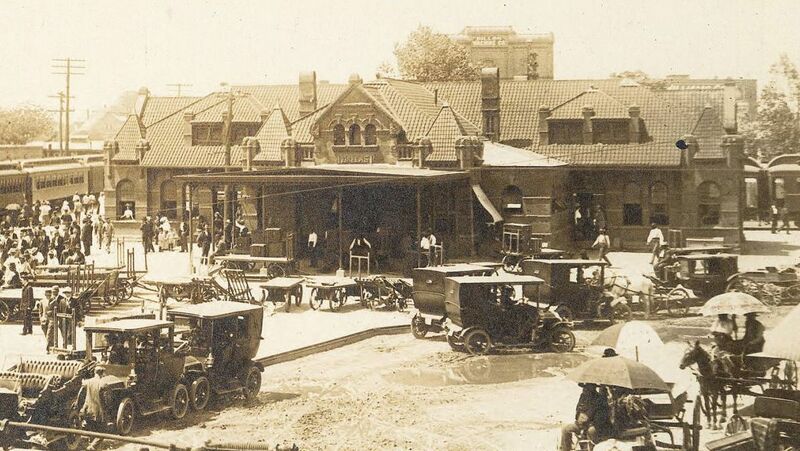 Photo of the depot with automobiles is a detail of a larger photograph from the collection of George A. McAfee photographs in the DeGolyer Library, Central University Libraries, Southern Methodist University. The original can be seen here. Photograph dated 1916 from The Museum of the American Railroad, via the Portal to Texas History site, here. Many of the pictures and articles can be clicked for larger images. Very interesting! I would have liked to see a map of where it once stood. Thanks, Alfredo! You’re right — a map would be helpful — I just added one above. Thank you Paula for answering a long-standing personal question. In the early 1950s while checking out the scene along pawn shop row on the south side of Elm Street I noticed a curious narrow alley running diagonally southeast between Elm and Main streets. 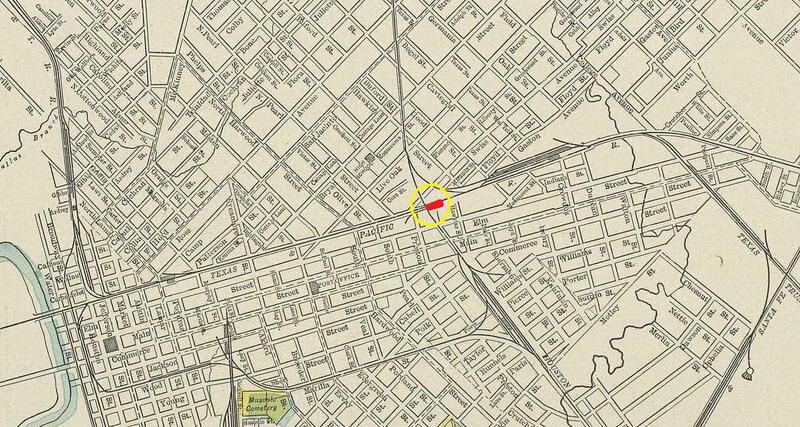 This alley (shown clearly in your map) was unpaved and looked like it might have been where a rail line had once run. Across Elm to the north was nothing I can recall clearly; across from the south (Main Street) end was Doran Chevrolet. Later I learned it was the old H & TC right of way and that there had been a station somewhere to the north. Never could find a picture (or exact location) of the station, but now you’ve taken care of that. Thanks again! Glad I could help with a nagging question, Bob! Old maps of the city come in handy to see so many things that don’t exist anymore. So many street names have changed since that map above. And it really is surprising to see how many of the old train tracks ran THROUGH the city rather than around it. Great report on an interesting Dallas building of yore! Before Dallas Union Terminal opened in October 1916, there were five separate depots in town–three of which were often called “Union Depot.” It gets confusing for us in the 21st century. The five are all gone now except maybe the Cotton Belt depot on Lamar. I wonder how much of the Greyhound bus depot might be remnants of the Cotton Belt depot. Hmmm…. I have maps of a lot of the old trackage that threaded through Dallas. Part of the Kessler plan was to get rid of some of it, elevate some, and build a belt railroad around the city. Thanks, Dennis. I came across bits and pieces of that while I was reading about the East Dallas station. One of the things I never thought about — since I didn’t grow up in the old passenger train-era — was that there were separate stations for freight and passenger trains. Sounds obvious when I think about it, but, like I say, I had never even considered that. Only this was not the plan actually chosen for implementation in the late 1890s for construction of a passenger depot on Commerce St.
Great drawing — thanks, Dennis! I’ll bet you author/speaker Rose-Mary Rumbley might know the fate of the Urbandale Park structure made from materials of the demolished depot. She wrote a book about Dallas parks. I hear she’s a very charismatic person. Location is Pacific @ Central road intersection. At the time that was a railroad intersection – Texas & PACIFIC and the Houston and Texas CENTRAL hence the names for the streets. Yes, separate passenger and freight depots were common except in smaller communities where the two were often incorporated into one combined structure. Recall that the Katy freight depot in the West End was in the news just a few years ago when it was illegally demolished. The Southern Pacific built a new freight depot at Canton St. in 1936 or so. A historical plaque was placed on the building at the time I wonder what happened to the plaque. 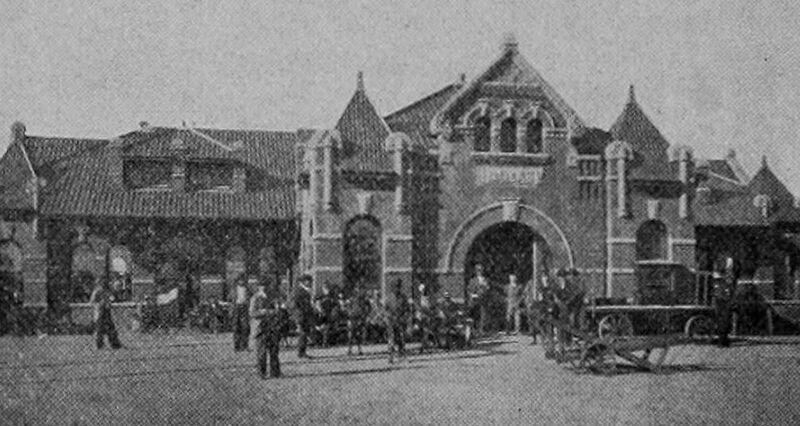 The depot was demolished in the last twenty years. Lots of railroad archaeology in Dallas: The freight tunnels, the old turntable pit exhumed in the West End, the two Dallas Union Terminal interlocking towers, the old T&P advertisement painted on the side of a building in Deep Ellum, and more. Excellent job Paula! Thank you for this and all your great work! 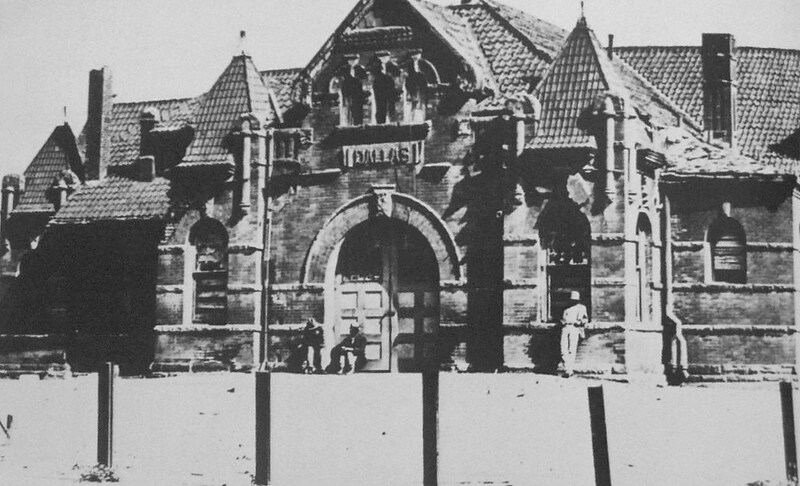 From the 8/12/1882 Callahan County Clarendon: “three car loads of our fine building stone were shipped this week for Dallas to be used in the construction of the union depot to be built there.” Do you know which depot this would have been? I believe there were 3 H&TC depots in Dallas at the same site over time. The one you cite was probably the 1880s H&TC version or second one. The third one was the version we see photos of most often. It stood until 1935 and was in service until 1916. If you look at Dallas Sanborn maps you can see the evolution of the depot’s outline over time.